M-Tech known as the prominent Indian smartcard manufacturer, offers a GPS based vehicle tracking device which has the model name as MTGPS. This device is a light terminal with GPS and GSM connectivity which coordinates with other data and transfers them via GSM. It is perfectly suitable for applications that need location acquirement of remote objects. Hence you can track remote objects like trucks, cars, ships and more quickly and easily. 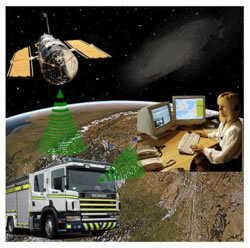 This GPS based vehicle tracking system by M-Tech can perform real time tasks of tracking vehicles and people. The system is portable that integrates GSM and GPS technologies. Its main functions include Geo fence/vibration alarm by manual or remote control, also avoiding static drifting and more. The system is water proof with high intense magnet in its rear cover that is capable of absorbing on iron surfaces including the bottom of the vehicle. With this you can track the exact location of the vehicle using the particular software platform. M-Tech GPS based vehicle tracking system can be used in various fields like logistics, financial, rent, detectives, police and more. Now, let us look into the important features of the GPS based Vehicle Tracking Systems offered by M-Tech.